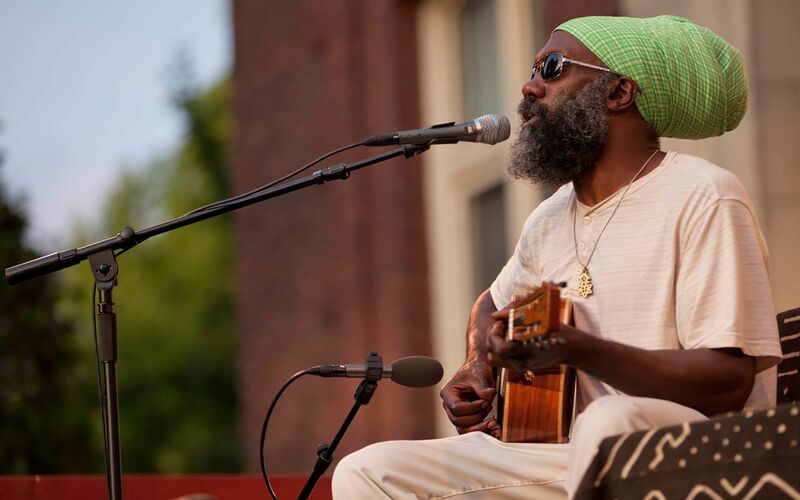 Heading to New England for concerts that include a Bates stop on Sept. 24, singer-songwriter Corey Harris ’91 checked in with a seacoastonline.com reporter in advance of a show at Portsmouth’s Music Hall. Harris launched his musical career not long after graduating from Bates, starting out with a tight focus on the blues that’s still at the heart of his music. He has some 15 recordings in his catalog, and in 2003 was the central figure in the opening episode of a multi-part Martin Scorsese documentary about the blues. But perhaps more germane to his Bates appearance Sunday is the fact that, as a Bates graduate, Harris received a Watson Fellowship to study pidgin English in Cameroon, following up on his senior thesis topic. Sunday’s concert honors the 50 years that the Watson Foundation has offered fellowships to students at Bates and other select colleges and universities. The concert is co-sponsored by the offices of the Dean of the Faculty and of College Advancement, and the departments of psychology and of French and francophone studies.